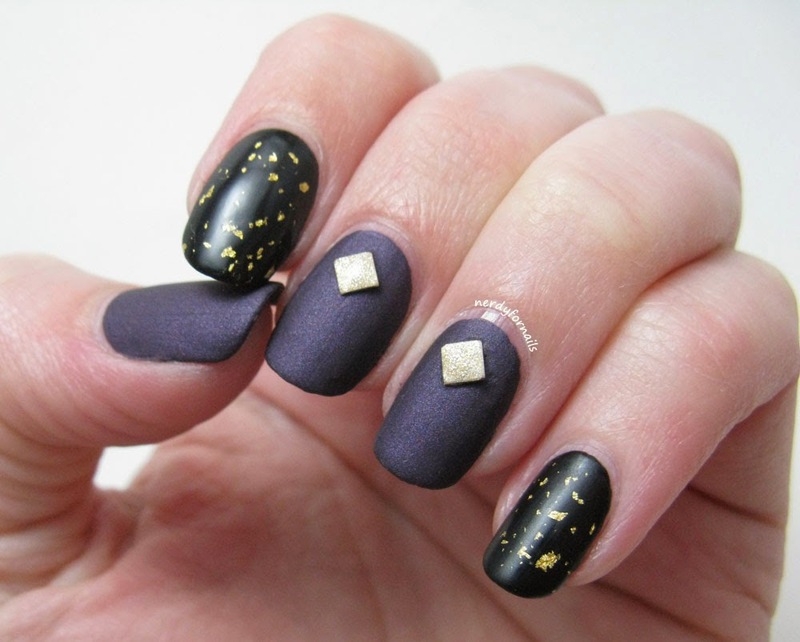 April's theme for The Lacquer Legion is Glam. I decided to combine this month's challenge with my first real indie polish review because what's more glam than getting to try out brand new polishes? 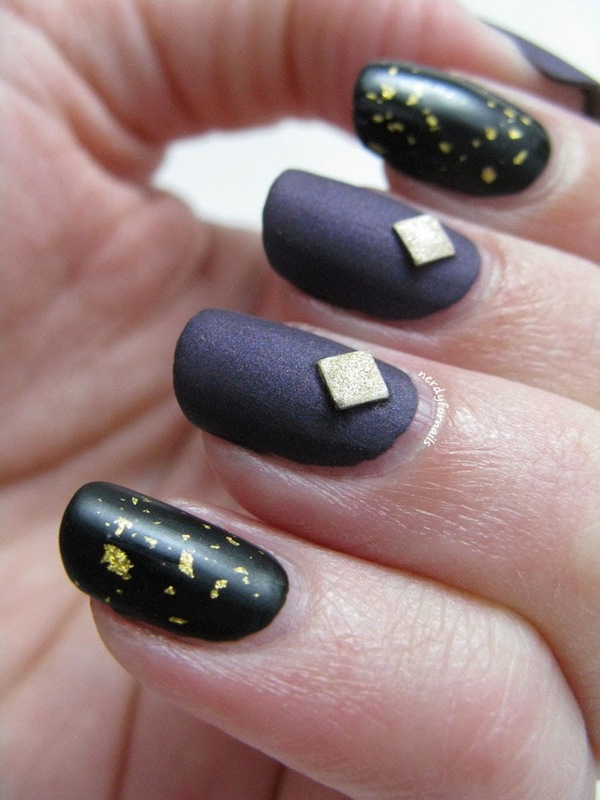 I went for a full on royal-glam look here with purple velvet, matte studs and real 24k gold leaf top coat. This is officially my first indie purchase too! I've been eyeing Mentality's store for a while now and finally decided to go for it. Their polishes are very reasonably priced- $6.75 for most regular polishes and a bit more for holos and other specialties plus free shipping within the US. I think what really pushed me over the edge was finding out Mentality is from Modesto. That's about two hours away from where I live and I love the chance to support local businesses. It was really hard deciding what to buy- so many beautiful polishes. The two that stood out the most to me were Matriarch, a gorgeous velvet looking matte purple (I'm a sucker for anything purple) and the 24k Gold Leaf top coat which was totally worth the splurge at only $15. 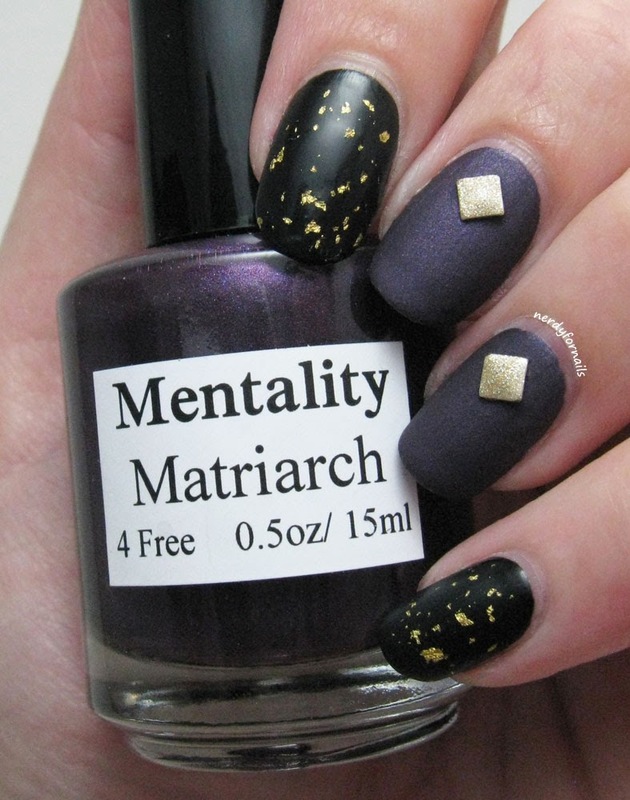 Matriarch applied beautifully and dried quickly with an even, smooth finish. I'm always concerned about drying time if I'm not going to be using a top coat. I went to bed soon after painting this and I'm happy to report no sheet marks. These pictures show two coats. 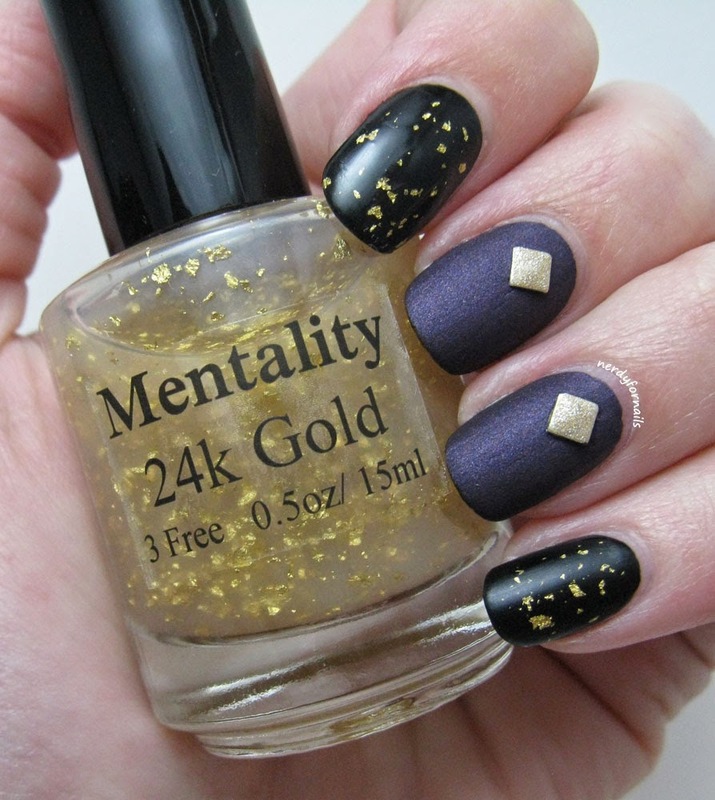 For the 24k Gold nails I painted two coats of LA Colors Black and topped it with two dabbled coats of the gold leaf top coat. I probably could have gone for a third coat on the pointer finger for extra gold leafiness, but I was getting sleepy and skipped it. Overall I'd say the gold leaf is dense enough in the base that it's not too hard to get fairly decent coverage with just two coats. I topped those nails off with a coat of NYC Matte Me Crazy to match the rest of the matte look. The last thing that really pulls this look together is the matte gold studs. Of course I didn't actually have any so I decided to make my own. I stuck silver studs onto a piece of tape and painted them with OPI, Love.Angel.Music.Baby from the Gwen Stefani collection. Once they were dry I picked them up with tweezers and carefully stuck them onto my 2nd coat of Matriarch while it was still wet. I love that I can make any color studs I want without having to buy anything new. I can't wait to try this out in so many more color combinations.